Please rotate your device to view the full pricing table. * Pension Counter Services: The Auto Enrolment specialists “The Pension Counter” will support you through the entire automatic enrolment process, for a single payment of £99+VAT. Employers signing-up for Essentials 50 get this service free. Primo Payroll has teamed up with automatic enrolment specialists “The Pension Counter (TPC)” to guide employers and payroll bureaux businesses through the automatic enrolment compliance process. TPC works closely with Primo Payroll and understand the software very well and will be able to set up everything for you. To take advantage of The Pension Counter services simply choose their service within your Primo payroll software or get in touch with them directly at primo@thepensioncounter.co.uk or on 01603 672787.
you to review your company pension submissions and monitor your compliance. tailored and the best possible quotes saving time and money for the employers and employees. There is no requirement to accept the quotes or cost for the bureau companies and employers. Primo Payroll is the only payroll software that completely automates Auto-Enrolment compliance and provides a completely integrated payroll solution in the cloud that is not only powerful and simple to use, but will also will save you lots of time. 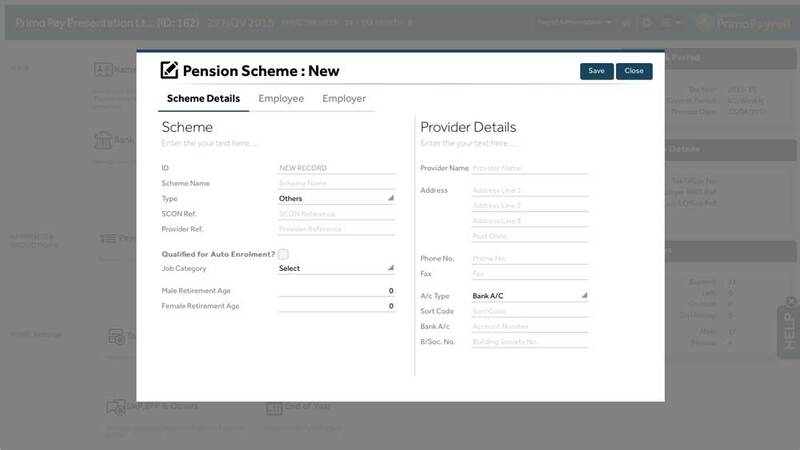 As you carry out your usual PAYE processes, Primo Payroll runs the Auto-Enrolment compliance processes in the background, communicates with your pension provider, completes all the the assessment and communication responsibilities, automatically classifies and enrols the employees, and calculates the contribution. Even the contribution payments are automatically processed by direct debit. Not a single bit of data needs to be imported or exported! RTI compliance is an integral part of Primo Payroll. 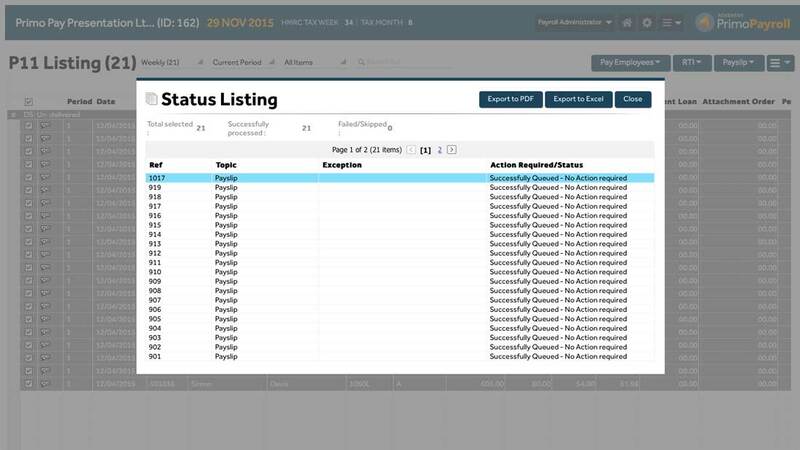 The software not only allows you to submit all RTI information including FPS and EPS, but it also tracks any pending submissions and makes sure you complete them. Primo Payroll makes sure you meet your obligations to HMRC – it’s that simple! As payroll software experts, we work with HMRC closely and always implement new tax year changes within Primo Payroll well ahead of time. You no longer have to worry whether your payroll software complies with the latest legislation. Primo Payroll makes it easy to send (and resend) professional payslips, customised with your company logo and details, to all employees via email. Our granular controls mean that you can either send to all employees at once, or only to selected employees – whatever you choose. Sending out P60s and P45s is just as easy. 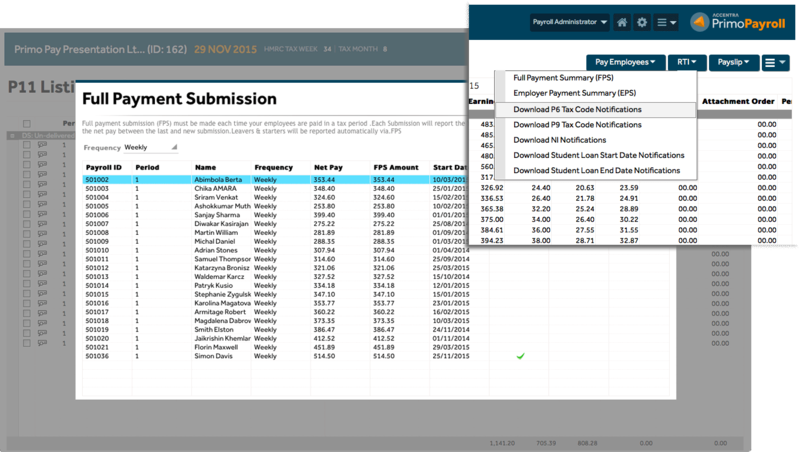 Just select the relevant employees and Primo Payroll can email these important documents to them with just a couple of clicks.